Batteries Plus has been trading since 2000 and has grown steadily since to become one of the best stocked battery companies in the UK. Our stock, battery knowlege and customer care make us front runners in the battery industry. Making a purchase could not be easier. Just browse our Catalog, and click on any items that you wish to buy and put them into the shopping cart. If you wish to remove an item, please select it and press 'update cart'. After you have finished your selection, click on "Order" and you will be asked for a few details that we need to be able to satisfy the order. Should you proceed with your order to us and subsequently wish to cancel it, please call us on 01474 705832 to cancel it, please do not just send an email as your order may be dispatched before it reaches us. Batteries Plus reserves the right to send you a product of the same or better specification, equivalent value and, in our opinion, equal quality should the exact product you require be out of stock. We accept Visa, Mastercard, Maestro and JCB. Please remember, we do not charge for any item until it is ready to ship and you may receive an email to say that your order is deferred - this is just saying that payment has been deferred until we dispatch your order and will not delay shipment. You may send your credit card information via phone on 01474 705832, by post or over the Internet. For Local Authorities, Government departments, Schools and Companies, you can call 01474 705832 to arrange orders. This covers your entire order by Royal Mail so that you know your postage costs before you shop with us. There are no hidden extras to surprise you at the checkout. Your order should be delivered to you within 2 working days, but please allow 5 working days before contacting us. If you require an order sooner, please call 01474 705832. 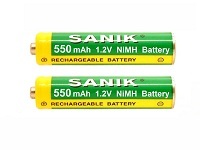 VAT @ 20% is included in orders as Batteries Plus Ltd is registered for VAT in the UK- registration number 846215135. We know of no documented cases of credit card fraud using our shopping system over the Internet. All credit card numbers are encrypted in the software when the order is placed using WorldPay secure payment services. They are not held in clear text on any web site. We guarantee your satisfaction. All of our products come with a 30 day guarantee provided the goods are returned to us in good condition and in their original packaging. Either a replacement part will be dispatched to you or a full refund of the cost of the goods made. Postage and packing charges are not refundable. If you need to reach us, please email us on sales@batteriesplus.co.uk, alternatively, you can call on 01474 705832 or write to us at Batteries Plus, Unit 1 Wildewood, Gorse Wood Road, Hartley, Kent DA3 7DE. Batteries Plus conforms with the requirements of the Data Protection Act, 1998. We do not disclose buyers information to third parties. Cookies are used on this shopping site, but only to keep track of the contents of your shopping cart once you have selected an item. "You" and "your" relates to the natural person reading this document that is: considering purchasing, has purchased from Waveley Group Ltd or is making an enquiry. After your purchase, we use a third party customer feedback service to send you an email and request for your feedback, which you may choose to leave. The feedback is held on the customer feedback service's website and on our website. The service provider we use is Soapbox. We do not use targeted advertising. If you have any questions or concerns, please do not hesitate to contact us through our contact us form, or by phone on 01474 705832. All of our products come with a 30 day guarantee provided the goods are returned to us in perfect condition, unopened in their original packaging. Either a replacement part will be dispatched to you or a full refund of the cost of the goods made. Postage and packing charges are not refundable in cases of incorrectly ordered goods.